Last issue ended with Batman overwhelmed by inky milk when he went to investigate Cobb's dairy farm. The following morning, we see the sons wake up. The contrast between Jon and Damien is played up well both here and in the Super-Sons book. They are early manifestations of their father. So rather than it all be political leanings and world views, it can skew towards humor. We see Jon dreaming of flying while holding onto his Superman action figure. He wakes up bright and cheery, ready to have breakfast and face the day. 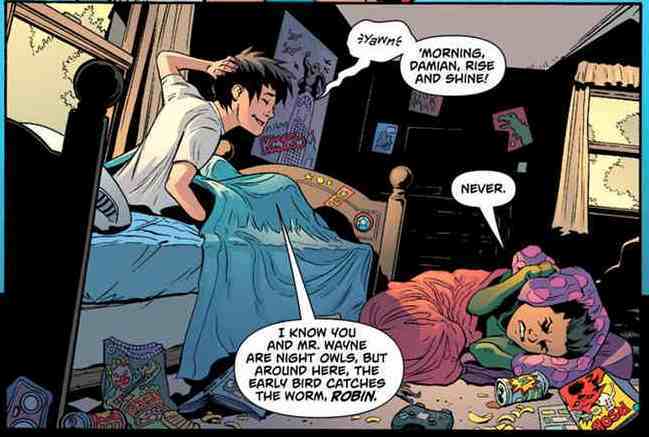 Meanwhile, Damien wants to cower in the shadows and never will 'rise and shine'. You could use this panel as a primer on these characters and I love it. Meanwhile, Cobb shows up to drop off the daily milk supply. There is something of a stand-off between Clark and Cobb here. 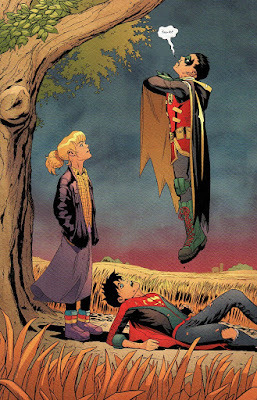 You get the sense from the glare and Clark's expression that these two know there is a lot unsaid here. 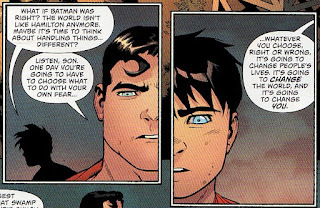 Cobb even hints that maybe he knows Clark's secret. This was a simple conversation between neighbors but there is a tense feel that leapt off the page. It becomes clear to Cobb that the Super-family is going to start investigating. Smoking a cigar in what look like an ill-lit evil lab, we see that he has been observing the super-family from afar. And it is time for a diversion. But there are a ton of clues here. The cigars. This prosthetic leg. The mad scientist routine. The mad giant squid he sends out to attack the town, the same giant squid we saw earlier in this series. Even those weird red pods. Add these to the creepy haunted house and the power corrupting milk, and there is a ton of information to process here. The Toyman? Professor Milo? Professor Ivo? I was sort of hoping more Cobb was a magic villain. Please don't make him Ozymandias! 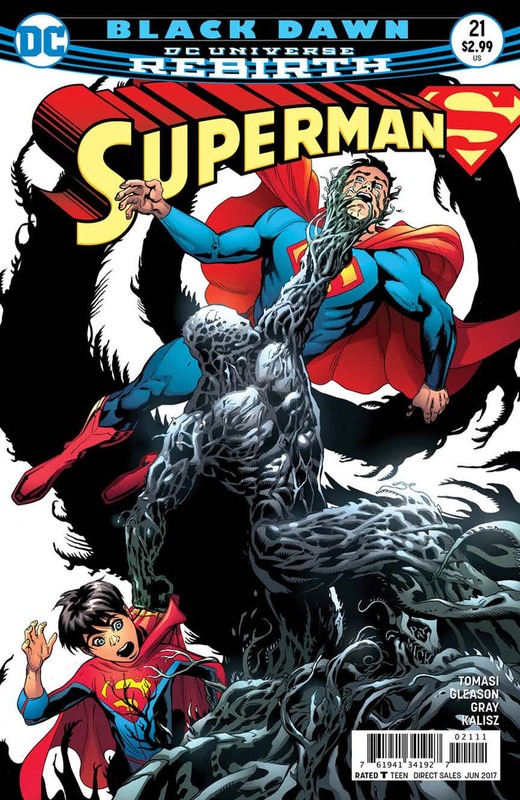 The giant squid flops around the town of Hamilton, leading the trio of Superman, Superboy, and Robin away from their search for the missing Batman. Superman keeps trying to corral the squid. As he says to the town people, he isn't an exterminator. The squid squirts his ink during the battle and the liquid coalesces into evil infantry. Now this doesn't look like the short, squat Cobb but the cigarette makes me think these are his form. Smoking Superman villains? Morgan Edge? The Prankster?? Superman tries his best to subdue the ink-men as well as keep the kaiju squid at bay. Meanwhile, the sons are flying around the town trying to save citizens. We see Jon being wooed by fame. Despite Superman doing the heavy lifting, Superboy is the headline on the Hamilton Horn. Jon seems thrilled. But this isn't about fame and publicity, this is about saving people. And then things get dicier. Superman cannot keep the squid contained, even when he drops a ferris wheel on it as a cage. With the townsfolk endangered, Jon cannot contain himself and cooks the squid with his heat vision. Anyone for fried calimari! This is the easy answer. This is Manchester Black justice. Will Jon succumb to the lure of praise and fame? But there is a great moment that results. 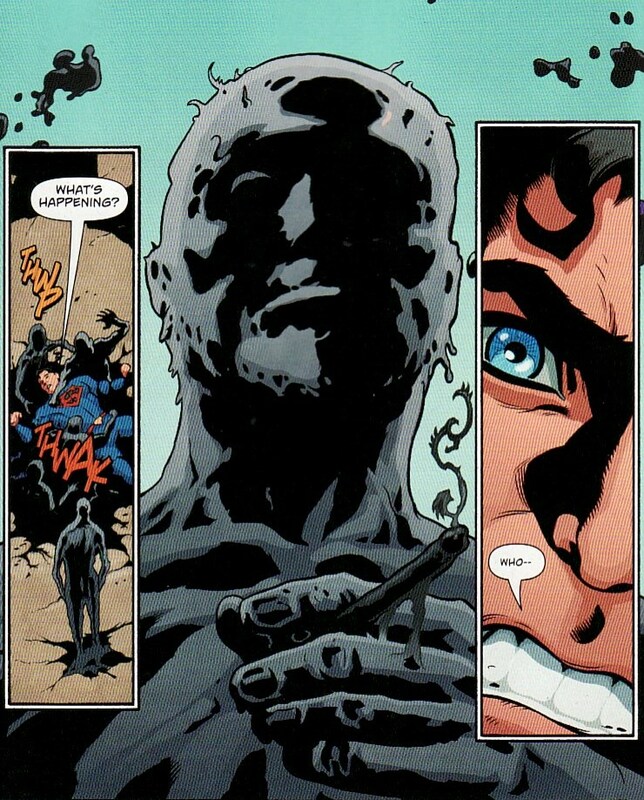 Jon wonders out loud if it is time for the super-family to become darker, to handle things differently. The world is getting to be a scarier place, maybe the ends justify the means. 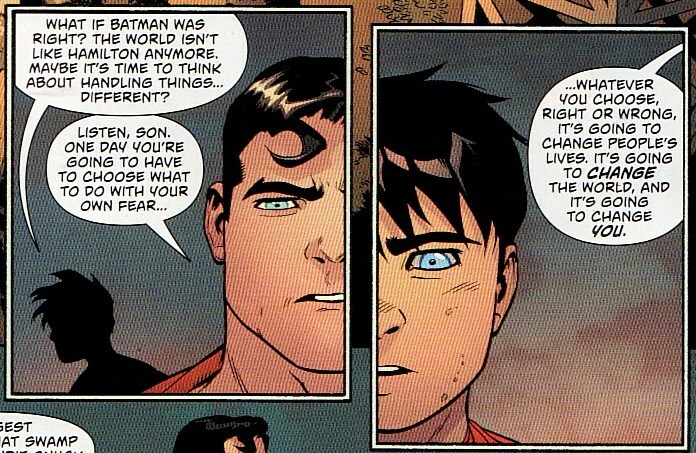 And then Superman drops some wisdom. Jon can change the world with his response. It's unsaid but the inference is clear. You can rise above and inspire. Or you can sink to the level of your enemies. The split panels show how similar these two are. This is what I need from Superman. But Clark isn't done. He is mentor and father. Between the squid move and heading into Deadman Swamp, Jon hasn't been listening to his parents. It is time for some punishment. He sends the sons back to the farm while he heads into the Swamp to try and find Batman. And then the plot thickens. Heck, it gels. Jon and Damien are stopped in their tracks, literally, by Kathy. She uses her powers to drop Jon, defends herself from his heat vision. And she uses a force choke hold on Damien. She says that everything that'he' (I assume Grandpa Cobb) is doing is to protect Jon and everyone else. But this attack isn't protecting Damien. And now the wacky Anj theory. I suppose it could be an artistic choice but look at Kathy's boots. And then think of the powers she shows here. And also how one color seems to dominate this scene, a sort of orange hue. Maybe she is innocent, somehow swayed by her 'Grandpa' and his thoughts of protecting people through control. Halo was always naive. But the big mystery is Cobb's identity. I suppose he could be someone new. But what do you all think. I definitely liked this issue a lot, a great sort of middle chapter to an arc, moving things forward and adding in some information. Great review, and I love the Halo theory. I was having a look at the old Outsiders member's powers, Kathy could be using the stasis beam or the tractor beam (perfect for a farm... 'tractor beam' is one of those sci-fi terms so familiar that I've only just realised I have no idea what it means). 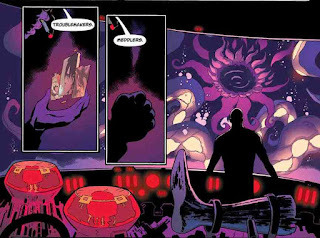 I was resisting the idea of Watchmen links too, but that squid did remind me a tad of Ozy's monster at the climax, and the Superman issue's colour scheme, with lots of purples and oranges reminds me of John Higgins' Watchmen work. Got him! 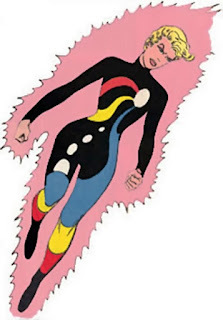 Towbee, the Minstrel of Space, from Action Comics #420. Probably not! 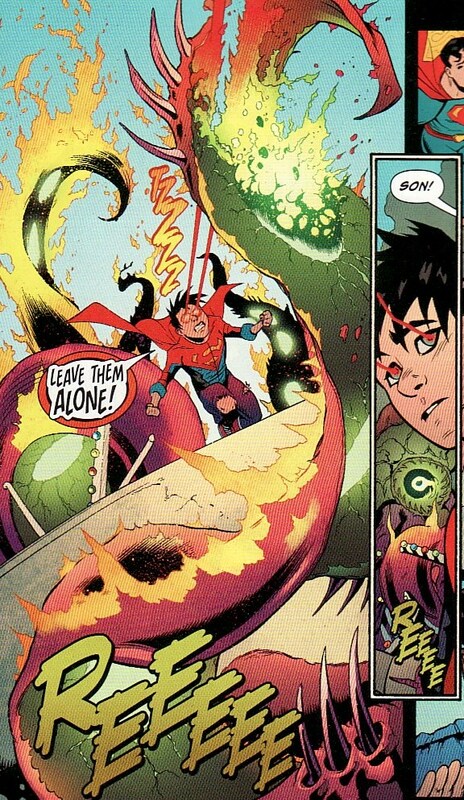 That Superboy and Robin panel is golden. This issue provides many clues. Too many clues. I cannot pinpoint a single suspect. Although that smoking ink-man stands out for some reason. Maybe that cigarrette is an important hint? 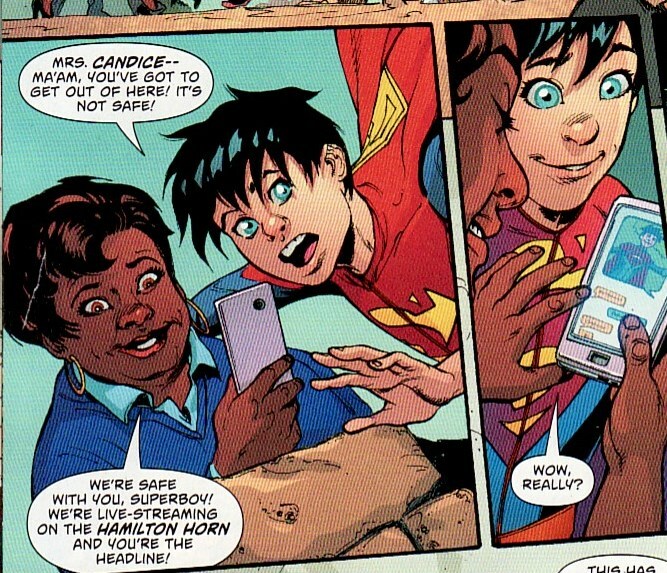 Aww... Superboy is becoming his hometown's idol, like his dad did in another reality. Superman's speech is real good and it reminds me of one of my favorite scenes of Kingdom Come: when Norman McCay told Superman that he always knew what to do because he instinctively knew what is right. Kathy... Halo? It would be funny. Anyway, the Hamilton subplot is coming to a head: the Kents have realized that town is hidding a dark secret that is harming their son, their neighbors are dangerous... everything is paving the way for their moving back to Metropolis. I wonder how they explained to their co-workers why they moved to that town. By they way, so far Clark has only confided to Supergirl, Batman and Wonder Woman that he was split. I like the implications that he trust them more than anyone else. I have accepted this title is going to write Lois out of character. Thanks for the Milk creepy neighbor. And exit stage left. To the meat of the story? Yes. Watchman vibes indeed. I read this weeks Trinity and Justice League because I was curious. The smoking guy had me thinking X-Files. And Kathy's role is interesting. That will be fun to follow. And yes, Karl,telling Kara is a great sign!